weekend until late night to evangelize many young ones who were once lost. But praise God, many of them are now found and active in our church with the faith and hope that there will be much more souls to harvest for Christ! God is so good and so faithful to His Promises! This month of September I will be going to Italy to help in the church of one of my brothers in the faith. He has also been working with youth ministry and we both believe that our hearts have a great joy to be able to share and bring to them the Good News about the Truth of the Gospel! Youth also form a very important part in the Kingdom of Christ and they MUST BE AWARE OF IT! ART Company Festival was held on Sunday, August 31, 2009. Youth from the streets filled the church and confirmed the results of handing out invitations out in the streets. It was a time of blessing not only for us but also for them through the performances that were held that day. Once again God´s power and move was shown to those who believe in Him as well as to those who met Him for the first time. Shiela, and invited them to attend our youth C.T. ministry being held every Friday. Surprisingly they came with their friends along. For series of meetings, they kept coming bringing more friends who were gradually introduced to the Gospel and accepted the Lord as their personal Saviour. 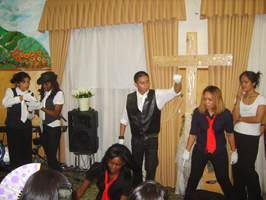 With these new converts, trained to dance and do mime we did our first evangelistic mini-festival at the Christian Center. They themselves excitedly went out to the nearby parks to give out invitations. That Sunday, about 60 young people turned up to watch the festival who after Dani´s challenge responded to pray the sinner’s prayer. It was triumphant, a miracle indeed! Evidently, this is the wave of the Holy Spirit moving among the young lives of this generation. GREAT THINGS to come! Glory be to God!